Macungie Borough Council is accepting Letters of Interest from Borough residents interested in serving as a Macungie Institute Trustee to fill a vacant position, term expiring March 31, 2020. The Trustees meet every other month, on the second Tuesday. If you are interested in serving in this capacity, please submit a Letter of Interest or a Statement of Interest to the Borough Office at 21 Locust Street, Macungie. The letter/statement should indicate your qualifications for the position. The position description is available at Borough Hall or on the Borough website. If you have any questions, please stop by or call the Borough office at 610-966-2503. Macungie Park is self-supporting and depends on events, volunteers and donations to keep the park, pool, playground, ball fields and bathrooms operable. Thank you for your help. The Lower Lehigh Lions Club Annual Spring Flea Market will be held Saturday, May 11, 2019. If you are interested in participating in the Market or would like a Dan Schantz Coupon, see the Registration Form. More information about the Lions Club Flea Market can be found in their Newsletter. If you have any questions about this event, please contact the Lions Club at lionsfleamarket@gmail.com. The Lions Club Chicken Barbeque Fundraiser will be held on Saturday, June 15, 2019 from 11:00 a.m. to 3:00 p.m. The cost is $9.00 per person. Out of Our Minds Art Studio we will hold its 1st Annual Chalk the Walk Macungie event on Saturday, June 22, 2019, from 9:00 a.m. until 12:00 p.m., at the Macungie Fire Company. They are looking for artist from 6 years old to adults, to show their artistic talents at this event. Cash prizes will be awarded. There are a limited number of sidewalk blocks available so sign up early! For more information see their flyer or contact Out of Our Minds Art Studio at (610) 762-5694 or artclasses@faidley.net. Permits for the Borough of Emmaus Municipal Compost Facility are now available at the Borough of Macungie, Town Hall, at a cost of $20.00 each. For more information click here. Electronics Recycling Day, at Macungie Memorial Park, 50 N. Poplar Street, Macungie PA, is scheduled for Saturday, November 09, 2019 from 9:00 am – Noon or until the trucks are full. This event is for Macungie Borough and Alburtis Borough Residents & Businesses Only. Photo identification may be required on the day of the event. Some fees may apply, depending on the item. At their November 05, 2018 meeting, Borough Council voted to adopt Ordinance No. 2018-05,Amending Chapter 329, Vehicles and Traffic, Article III, Parking Regulations, by adding parking restrictions along Village Walk Drive in Section 329-29.A. Medium or Heavy Trucks and/or Truck Tractors or Trailers are not permitted to park on either side of Village Walk Drive. At their November 05, 2018 meeting, Borough Council voted to adopt Ordinance No. 2018-06, adding a new Chapter 267 to the Macungie Borough Code of Ordinances, Residential Rental Ordinance, regulating Residential Rental Unit occupancy and provide for the registration and inspection of such units and penalties for noncompliance. At their August 06, 2018 meeting, Borough Council voted to adopt Ordinance 2018-02 Amending Chapter 274 of The Macungie Borough Code of Ordinance, Sewers, by Adding a New Section 274-33.1. Building Sewer Inspections will be required upon the transfer/conveyance of ownership of a property, when there is a change in use or if suspected issues are noticed when the Borough performs rehabilitation and/or replacement work on the Borough’s sewer line, which the property’s building sewer is connected. to the Borough of Macungie. Macungie Volunteer Fire Department is looking for volunteers to be part of their team. Click HERE to view pamphlet for more information and how to volunteer in the Fire Department. Nixle is a notification system to keep you up to date with relevant information about the Borough, such as when snow emergencies are called. Click HERE to sign up. Don't forget to sign up for the Borough Notification System (SWIFT911). 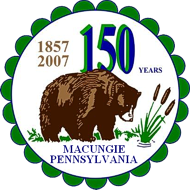 Macungie is a Lenape Indian phrase signifying "The feeding place of the Bears" or, as it was translated by the early Pennsylvania German immigrants, "Baere Schwamm" (fertile meadow of the bears). The Macungie region was first settled by Pennsylvania German immigrants around the year 1735. The village of Millerstown, now the Borough of Macungie, was established in 1776 by Peter Miller of Upper Hanover Township, Montgomery County, when he purchased 150 acres of land along a King's Highway in what was then a portion of Northampton County. On November 15, 1857, the village of Millerstown was incorporated as a borough. In 1875, the borough was renamed Macungie. Macungie (pronounced ma-CUN-gee) is the second oldest borough in Lehigh County, Pennsylvania. The Borough has a total area of 1.0 square mile.